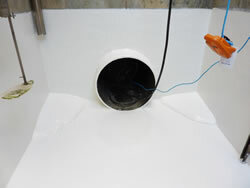 Morrison Utility Services commissioned us to work on a number of Southern Water’s waste water treatment sites and instructed us to line a number of final effluent inspection chambers in Kent, Sussex, Surrey and Hampshire. 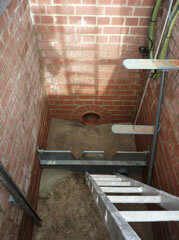 The chambers were used for checking and monitoring the quality of water leaving the waste water treatment sites. Each site required a lining that would be durable, environmentally safe, white for ease of inspection and provide a smooth surface for the ease of cleaning. 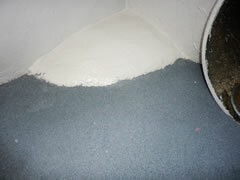 The lining system currently specified for lining the chambers required the surface of the concrete and brick to be completely dry prior to application. As the work would be carried out during the winter months, it was not practical for us to use that system on existing old concrete or brick chambers, as the surface would certainly be either damp or wet. 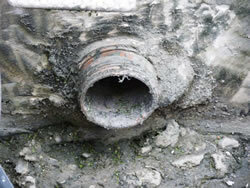 We therefore agreed to provide a lining system that could be applied to either damp or wet concrete or brick surfaces. The chambers were constructed from either concrete or brick. All of the concrete chambers had holes in the surface of the concrete left over from the construction process. 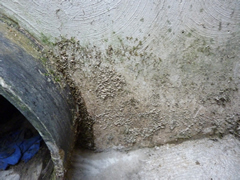 The conditions within the chambers would for the most part be damp or at least contain high levels of humidity. The work would predominantly be carried out in low temperatures conditions. Many of the chambers would be classified as being confined spaces. Resin materials were required to be tolerant to damp or wet conditions during application and suitable for fresh "green” concrete. The risk of possible ingress of water during the works was apparent. 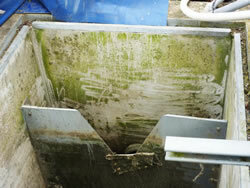 The surface of the materials used needed to provide a glossy surface, which would ease cleaning and inhibit algae growth. The coating system had to be environmentally safe and non-toxic. The coating system needed to be durable, as the constant flow of water would have an erosion effect on any material used. It also had to be flexible because the chambers are subject to temperature variations. 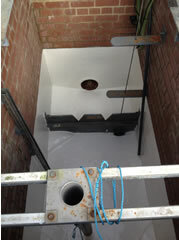 A site team from Morrison Utilities Services prepared the chambers for us by erecting a tent over the site, carrying out basic cleaning of the chamber and inserting inflatable bladder bungs into the inlet pipework. They were also responsible for correcting the falls, installing benching in the corners of the chambers and new weir plates as required. Morrison Utilities Services redirected the final effluent water to a temporary tank system whilst our works were being carried out. 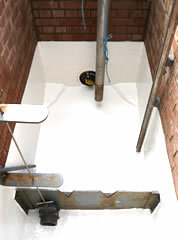 Because the chambers were all unique in their construction, size and dimensions, we devised a resin based lining system that could be applied to damp and wet conditions, and would be generic in its capacity to provide a hygienic durable surface that was environmentally friendly and could be jet washed when necessary to meet with the high standards that a modern water treatment facility requires. We abraded the concrete and brick surfaces, and after cleaning we applied a green concrete damp surface epoxy based primer to the walls and floor of the chambers. 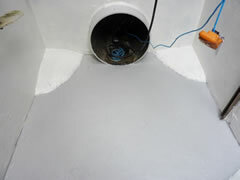 The following day, we trowelled onto the walls of the chamber a screed of damp surface tolerant epoxy resin based paste filler to fill the holes and smooth out the uneven surfaces. 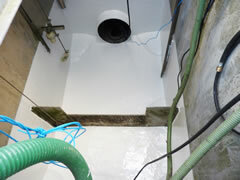 If the surface of the floor of the chamber was in particularly poor condition, we applied a thick resin mortar slurry to improve its strength. During the following two days we applied four coats of moisture tolerant solvent free epoxy resin to the walls and floor of each inspection chamber. Each coat process was applied in different a different colour to ensure complete coverage each time. It took three to four consecutive days for us to complete each chamber and we followed the same process for each treated site. The final surface coating was smooth, glossy and finished in white, which will aid inspection, be easy to clean and deter the growth of algae etc. 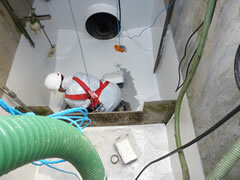 The chambers were left with the inclement weather protection tent in place, which the Morrison Utilities Services site team dismantled when they returned to site.